Wiko Mobile has been a little quiet of late. After an aggressive entrance several years ago, the French smartphone has been under the radar in Malaysia, with its last device being the budget Tommy3. The good news is that, it’s back. And in style too. Today, it launches the View2 Pro – its latest full-screen device (with a notch no less) with strong dual-cameras and a pure Android experience. The one thing to appreciate about a Wiko device: the price. Remember the Wiko View and View Prime launched last year? Well, the Wiko View2 Pro is the top-of-the-line model in Wiko’s full-screen View range. It sports a 6-inch HD+ (720×1528) IPS display with a 19:9 screen aspect ratio. You’ll notice an Essential phone-inspired minimal “U-shaped” notch at the front, which is possibly the best implementation of a notched display to date. The cool thing is, Wiko has done some customisations to the Wiko UI to take advantage of the notched full-screen display to give you better immersion in movies, games and all your apps. The near-bezel-less display is housed in a sleek curved plastic glass body and metal frame, with an elegant chrome finish, offered in either Anthracite or Gold colour options. It’s the best-looking and most premium Wiko device to date, in my opinion. The handset feels good in the hands, and I almost forget how much it costs. Under the hood, the View2 Pro uses the octa-core Qualcomm Snapdragon 450 mid-range chipset mated to the Adreno 506 GPU. Never one to hold back on memory, Wiko has thrown in 4GB of RAM and 64GB of storage into its latest device. There’s storage expansion via microSD (up to 256GB) in case you need more. In terms of the camera, the device rocks an impressive 16MP dual-camera system based on the Sony IMX499 sensor coupled with f/1.75 aperture wide-angle lenses on the rear. It comes with Super PDAF and a dual-tone LED flash. On the front, the big 16MP selfie shooter is claimed to capture 4x more light thanks to Big Pixel technology and its fast f/2.0 aperture lens. Big Pixel is based on the concept you’ve heard of before – combing four pixels into one, resulting in four times the photosensitivity. Selfies wouldn’t be complete with some sort of beautification magic or bokeh, and the View2 Pro’s selfie camera has Live portrait blur as well as Face beauty to do just that. By the way, both camera systems come with FHD electronic video stabilisation, which is handy in eliminating shaky video footage. Wiko has added other camera trickery as well including Live Auto Zoom that lets you follow a subject and transition between wide and close crops seamlessly, Slow-mo and Time lapse. For security and authentication, the device supports Face Unlock in addition to its rear-mounted fingerprint sensor, and is also equipped with NFC. The dual-SIM, dual-LTE device supports 4G LTE Cat.6 and features a hybrid tray (1x nano-SIM, 1x nano-SIM/microSD). Keeping it juiced is a 3,000mAh battery that charges up via micro-USB. With the introduction of the View2 Pro, Wiko is offering several customised accessories (sold separately) including a Smart folio case, shock-absorbent Pro case and an anti-fingerprint 2.5D tempered glass screen protector. 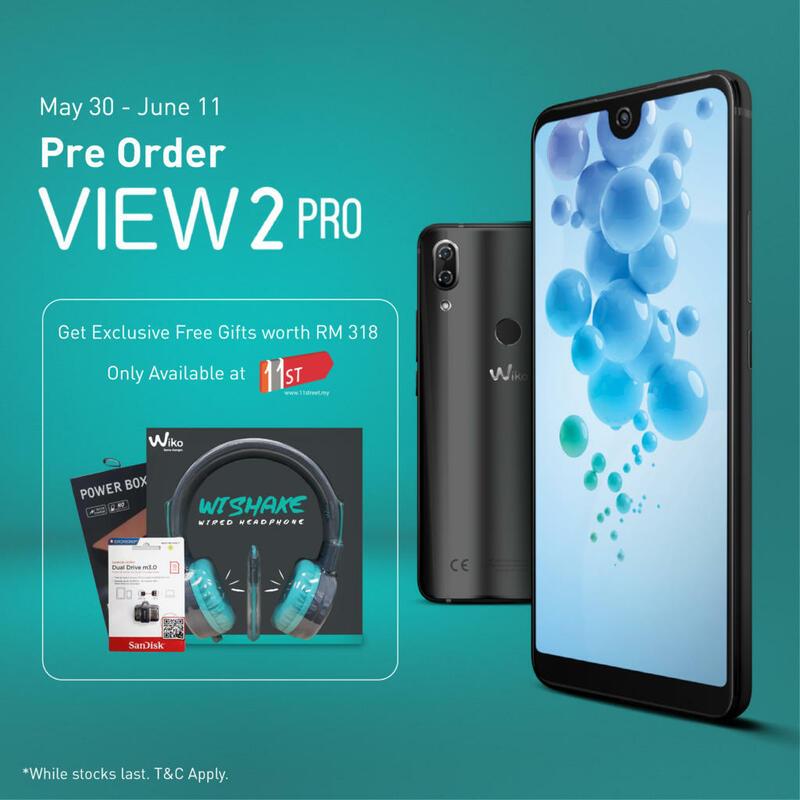 The Wiko View2 Pro retails for MYR999 and is sold exclusively by 11street. You can start pre-ordering today, 30 May until 11 June 2018. Pre-order buyers will receive free gifts comprising a set of headphones, powerbank and USB thumbdrive. Head over to 11street to pre-order. For more information, visit my-en.wikomobile.com. Why buy when you can rent an iPhone X from MYR99 per month?